Signature Dishes: Monster Kong Nachos® - A large variety of nachos – bean & cheese, picadillo beef, shredded chicken, chicken fajita & carbon (mesquite) beef fajita nachos, served w/queso, guacamole & sour cream. Any substitutions are extra. * The Full Size Monster Kong Nacho is enough for 5-8 people. $2.49 for a fresh made double fisted Pastor Pork taco with fresh tortillas, pineapple, cilantro and onions. 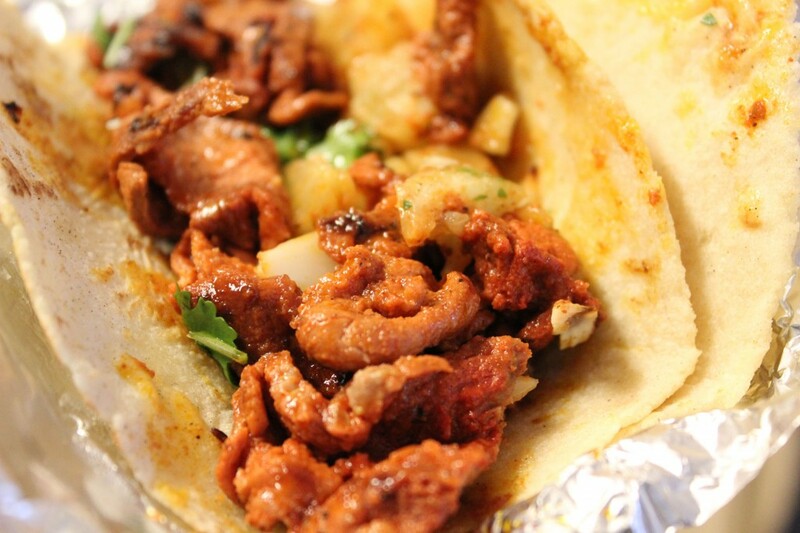 That’s about all I need to say about this taco – combined with the picture, you should be running out the door to get yours (if you live in Houston). Chacho’s is something of a novelty here in Houston – it most definitely has a following, judging from the packed parking lots on the weekends and during most weeknight evenings. It’s cheap and good – basic Mexican food with everything that you need to fill up plus a bit more. Since Chacho’s is right down the street from us – I could walk there – I decided to pick up some brunch to satisfy my spicy food cravings that were brought on after searching through all of the old HSB photo archives. Because their menu is so large, I never order the same thing twice – so today I went with the Pastor Pork tacos. While I was waiting for my order, I could see my tortillas being made and the pastor pork being cut – talk about fresh! These almost didn’t make it home – and I only live a block away. The meat was tender, juicy and had a great charcoal flavor. 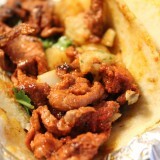 The pineapple lends a nice sweetness that balances the pork – and the cilantro and onions is a must. I inhaled one taco before even sitting down to eat and polished off the second without even adding hot sauce. Shocking but true – the flavors were too great to wait. If you want to go check this place out, let me know. I’m looking for someone to help me polish off one of their plates of Monster Kong Nachos® – A large variety of nachos – bean & cheese, picadillo beef, shredded chicken, chicken fajita & carbon (mesquite) beef fajita nachos, served w/queso, guacamole & sour cream. * The Full Size Monster Kong Nacho is enough for 5-8 people.